Brewed with coffee and chocolate and aged in bourbon barrels, this is my first ever Lost Abbey beer. Some of you may know how some of their wild ales demand absolutely ludicrous prices on trade forums, but I'm sticking to what I love, and that is big, barrel-aged stouts. Plus, that might be the coolest label I've ever seen. Pours as black as a Spinal Tap's "Smell the Glove" with not even the faintest hint of dark brown or ruby red on the edges and it produced less than a finger of dark brown head. Bourbon-soaked espresso on the aroma. Milk chocolate, lots of oak, vanilla, sweet bourbon, and even a hint of smoke. The taste has a dark fruit component that was missing from the aroma as some black cherry is added to the bourbon and they are making beautiful music in my mouth. Bitter dark chocolate is rampant throughout and I think that is accounting for the iced coffee flavor I am picking up. I know I picked up a bit of smoke on the aroma, but the taste is more roasty with some charred oak from the barrels. It's only near the finish do I get some alcohol from that 13.50% abv, but it isn't surprising to see it, and I can forgive its presence since it's such a big beer. Mouthfeel is thick and viscous as it should be. I mentioned the minor alcohol sting on the taste, but again, its easily tolerable and won't piss on your bonfire. The flavors coat your tongue and the bourbon lingers forever in a blissful way. Track #10 had a superb nose and while the taste was great, I don't think it quite matched the aroma pound-for-pound. 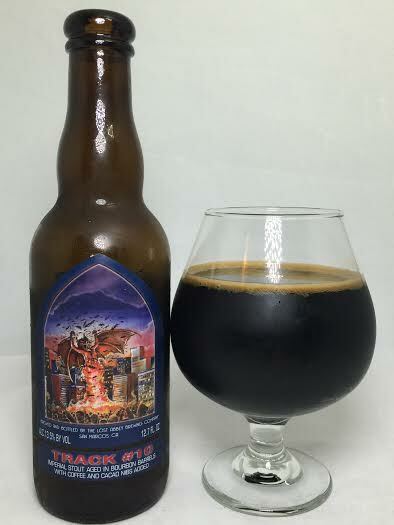 I was hoping for the coffee and chocolate to really pop on each sip, but instead this beer relied more on the roasted malts and barrel to do all of the heavy lifting. A good, but not great BA stout.